The Center for Human Rights and Constitutional Law is a non-profit, tax-exempt, public interest legal foundation dedicated to furthering and protecting the civil, constitutional, and human rights of vulnerable low-income communities. Since its incorporation in 1980, under the leadership of a board of directors comprising civil rights attorneys, community advocates and religious leaders, the Center has provided a wide range of legal services to vulnerable low-income victims of human and civil rights violations and technical support and training to hundreds of legal aid attorneys and paralegals in the areas of constitutional law, international human rights, and complex class action litigation. 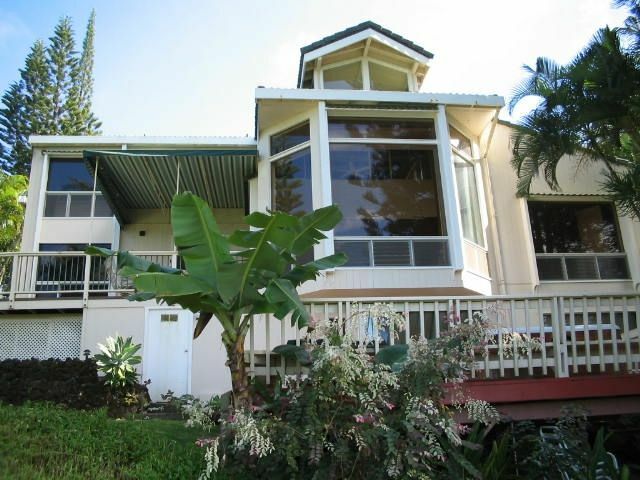 Organizations interested in using the Kauai home for a retreat should review the Reservations link on this page and should contact Peter Schey, CHRCL President and Executive Director, pschey@centerforhumanrights.org, or the Center's Administrator, (213) 388-8693 ext. 302, admin@centerforhumanrights.org. Visit www.centerforhumanrights.org for more details. This is a beautiful cedar wood house with large floor to ceiling windows in the living room and amazing views of the ocean. House is on a very quiet cul-de-sac so very little (almost no) traffic. Room for 3-4 cars. Lovely garden. Great location ... 3-4 minutes to Foodland in Princeville, couple minutes to golf course and tennis courts, and centrally located on the North Shore so you can drive to beaches close by going either east or west along the north shore. By end of September 2018 will have replaced old AC with new units in living room, master bedroom, guest bedroom on second floor, and office on main floor. The dining area is in a large open area including the living room with a full on view of the ocean through floor to ceiling windows. A bar counter separates the dining area & the kitchen. A variety of books (novels, classics, Kauai etc.) are available in the downstairs office and living room bookshelves. A variety of board games are in a closet in the living room area. There are three deck areas. One off the studio at the bottom level with a jacuzzi and ocean views. Two off the main floor both with ocean views. Great place to eat meals, read, watch the sunsets! Snorkeling gear for several people is available at the house. Tennis courts are 3 minute drive from the house in Princeville. Beautiful Princeville golf course is a 3 minute drive from the house in Princeville. Main floor, including living room, dining room, kitchen, one bedroom and 2 bathrooms are accessible using two ramps located on site. Call for more details. There is an indoor sauna on the main floor of the house. Whale-watching views from several rooms! At additional cost we can arrange a chef, concierge, massage, etc. Excellent service and great home for a large group! Loved every minute of our time on Kauai. The weather was outstanding until the Sunday we left. Great accommodations in Princeville. Peter Schey and his staff were great to work with. He even spent time with me on the phone giving me information about the island. He was flexible when we needed to change a date. When we got to Princeville, Robert was at the home when we arrived. He was amazing! Very friendly and accommodating. When we had a question about the house he was very accessible. The home is a little older, but has been taken care of. You can’t beat the view. Ocean and beach just below the home with huge windows that allow you to see everything. My family of 10 were comfortable all week. The location was great, but it was quite a drive to the south and west side of the island. However, the drive allows you to see some of the most beautiful scenery in the world. We loved our stay and will come back again. We were 6 adults and three children. Dinners all prepared at home. Kitchen has way more than what's needed, including sharp knives, pots and pans, dinnerware, plates - although for purists, sets often did not match, but no problem at all. Beds were comfortable, bedrooms spacious, excellent water pressure in showers and plenty of hot water. Living rooms and dining areas were just magnificent, as were the views, with comfortable furniture. We did not use the large-screen TV at all, as beaches were just moments away, with great shopping opportunities. We did not try the local Foodland store, as we stocked up in Costco and Safeway on our way to Princeville. Even if you buy three times what you need, Costco is less expensive for most items except for local produce in local groceries. My wife and I stayed in the downstairs apartment. We had a large outdoor deck with a large hot tub and superb views. Kitchen equipment was Ok for our needs, mainly coffee, as we cooked and ate in the main house, but also had a fridge and microwave. The living room also has a large deck with great views of the ocean. The garage has a good-size washer and dryer as well as beach equipment, all of which worked. The recent storm caused some damage, but there are also some elecctric outlets that did not work in the downstairs apartment, and some of the post storm renovations, such as outdoor painting, is sloppy. 3 vehicles can easily park in the driveway, and there is a nice large back yard area. Wifi is very high speed. We stayed for 6 nights, and everyone loved the house. Highly recommended. This is a spacious home with a very interesting layout and magnificent views from floor to ceiling windows of the ocean and mountains. The home has enormous potential but suffers from longtime neglect. While we understand efforts are currently being made for restoration, many, many problems continue. A quite substantial cleaning fee is charged by the owner. Upon our arrival we found it necessary to do our own cleaning. The downstairs bathroom by the office was disgusting with dirt and grime in the tub. There was dirt on the floor with dead insects. We found an insulin needle under the kitchen counter. Debris was scattered everywhere in the driveway. A burnt out bulb here and there in such a large house is understandable. There were multiple outlets literally with exposed wire. Some rooms (north rooms and downstairs suite) completely lacked power. While the owner did refund a portion of the rental, we felt it necessary to write this less than encouraging review. We would return, simply because of the beauty of the setting..but let the prospective guest beware. The most beautiful view and garden on the island for a private home! WE loved our time at this rental. Thank you to the team who keeps this place beautiful. The birds and the views are amazing. We miss it already. Run down home. Really a shame. The home is a beautiful layout. I do not believe the description was accurate of this house. So run down. Not key when we got to house. Had to wait a long time for someone to show up to let us in. (and it was raining). But I have never stayed in a place that was so run down. The house was not that clean. Table, counters, windows. One of our party cut her foot on a piece of glass in the kitchen when we first arrived. Windows were dirty and sticky on the inside. Table and counters were dirty and sticky. One roll of toilet paper per bathroom for a weeks stay for 12 people?? No hand towels or dishrags in kitchen. Dishes and silverware must have been donated or bought over time as almost nothing matched. The dryer was broken and that put a kink in things for us big time. Many broken blinds through out the house. Issues with the downstairs tv. Turns off on its own. No instructions on the use of the various electronics there. There were so many lights that did not work it was crazy. Light switches with tape over them so you did not use them. The grounds were not kept up at all. When we got there the driveway and walkways were covered with tree branches and palm fronds and sand. Exposed conduits that must have had wiring for lights at one time, broken all over the yard, wires laying around. BBQ grill cover just laying in yard, hose just dumped beside house. Railings rotten, deck boards rotten, trim on the house is rotted away, very bad bee problem up in the eaves. Gutters have trees growing in them. Really a shame because it will take 10's of thousands of dollars to fix it. Great private snorkeling five minute hike down a secret trail from the house.